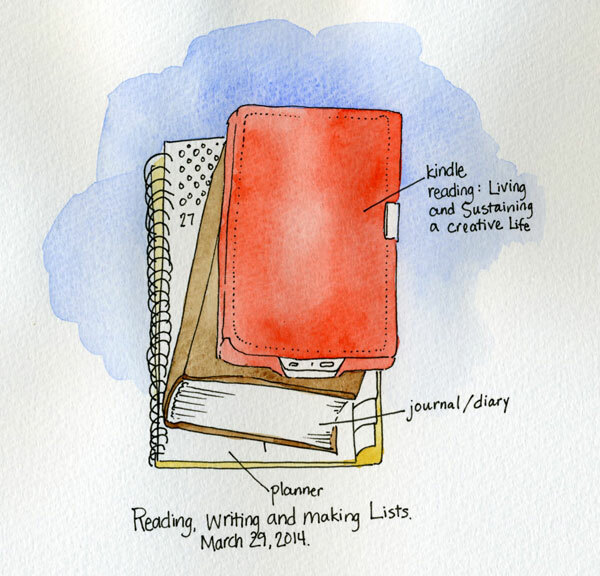 ©2014 Carolyn A Pappas, 3-29-14 Sketchbook. Pen and watercolor in 7 x 10 inch sketchbook. Living and Sustaining a Creative Life: Essays by 40 Working Artists. Edited by Sharon Louden. This book is a collection of 40 essays and interviews which are first hand accounts of what it is like to live and work as an artist. I really enjoyed this book because, for the most part, it is really down to earth and the essays were short little nuggets that I could read in one sitting. The various artists are very upfront about their lifestyle and the struggles they have had in earning their income from their art. There are only a few examples of “art speak” and I skipped over these essays. One of the similarities I see in all these artists (as expected) is that they are disciplined with their time. It seems that the artists with children require the most discipline to get work done while their kids were in school, daycare or being cared for by their partner. Having a supportive and self-sacrificing family also seemed to be crucial to their success. Besides living in NYC and being a people person, the common trait I noticed in all these artists was the willingness to take a calculated risk, much like any entrepreneur. I fear the unease of not being able to plan on stable income, especially with a child to support, would be too uncomfortable for me to tolerate. This is why I am personally thankful for a full time job with benefits. A number of the artists featured in this book worked side jobs or full time jobs for a long time before becoming successful, and it encouraged me that they still considered themselves artists throughout.